Spurred on by the superb backing of the Mighty Hayes & Yeading travelling Army from the terraces, the visitors got the perfect start after just eight minutes. Esmond James, starting in place of the suspended Will Hendry, crossed from the right flank and the ball was met perfectly on the half volley by Steve Perkins with the ball soaring into the top corner of the Newport net. 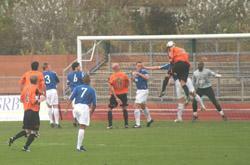 With the wind at their backs, the Exiles began to forge their way towards the United goal in pursuit of an equaliser. Home skipper Ashley Vickers managed to flick on a centre towards Rob Duffy, the striker took a chance with a first time shot but this went well wide of the target. Minutes later Duffy played the ball in from the left side, Leon Osei controlled the ball on his chest and shaped to shoot only to be denied by a well timed Ronnie Bull challenge. A speculative Ram Marwa volley from 40 yards had keeper Glyn Thompson scrambling but the ball was a foot wide of the Newport goal. Just a minute later United had a major let off, a throughball to Craig Reid saw Matt Ruby slip leaving the striker clear on goal, he duly beat Preddie only for the ball to come back off the post into the keeper's arms. The let off only lasted three minutes though, Reid picked up a long ball and as he turned a Bull tackle took the ball past Tom Cadmore allowing the Exiles striker to attack Preddie, this time he found the corner of the net to draw the game level. This was the last real action of the first half, the second though was to belong to Hayes & Yeading who went on to beat Thompson four more times to create a club record away victory. 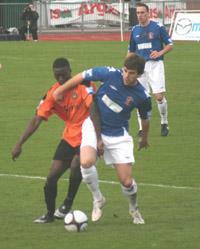 It took just six minutes for United to regain the lead, James beat Steve Jenkins on the wing and played the ball inside to Scott Fitzgerald, rather than try his luck from an angle, the striker picked out James Mulley on the left of the area and he sidestepped a tackle before planting the ball into the corner of the Newport net. Mulley then had another shot from 25 yards but this was held by Thompson, then Fitzgerald effectively sealed the game with two goals in just over 60 seconds. The first, and United's third saw the ball at the feet of Mulley who was one of four United players running against a lonely Vickers in the non-existent Exiles defence. As Vickers approached Mulley, the midfielder slid the ball into Fitzgerald's run and he clinically finished from just inside the area. Just a minute later Fitzgerald was lurking in what would have been an offside position but for the fact that the ball was headed to him by Vickers, the striker firing across Thompson and into the far corner. Minutes later Reid, who was far and away the home sides best player, found space on the corner of the United area but his fierce drive was just outside the angle of post and bar. This chance for the home side was just the spur for United to get another, and on 71 minutes they did when Josh Scott dived to head home a near post Danny Allen-Page near post cross. With the game "in the bag" little more goalmouth action happened, Danny Rose fired wide from the edge of the area and in stoppage time Reid again went close but Preddie made a fine diving save from his close range shot. Website United Man of the Match: Esmond James. Fitzgerald (63, 64), Scott (71).